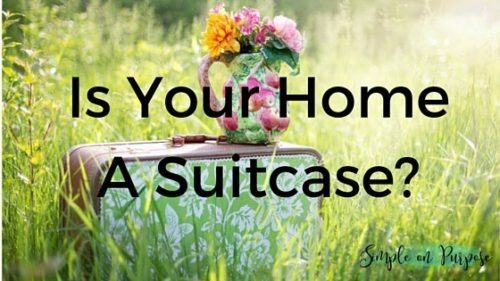 Is Your Home a Suitcase? This could be a post on being worldly, nomadic and always ready to pick up for the next whimsical adventure. It is about how we view our homes. As we’ve leaned in to ‘minimalism‘ I have found there are ups and downs to making it work as a family of five. Yet, as we have gotten rid of the things we don’t love, use or find beauty in I’ve come to view my house differently. ALL OF THE SWEET-LOVIN STORAGE THAT HAS EVER BEEN PINNED! EVER! I still would love all of these things. Except the intoxicatingly beautiful mass amounts of storage. Because we don’t really need it. We have one little closet in our bedroom that was stuffed to the max when we moved in five years ago. After purging the closet and starting a Capsule Wardrobe I see no need for anything bigger. In fact, now I want to challenge Conor and I to send one of our dressers to the basement. Fine, maybe I just want his work laundry to live in the basement. Fine, maybe I want all of our laundry in the basement. Have you every wondered why the laundry room hasn’t morphed into one giant dressing room for the whole family? Imagine! No laundry up and down the stairs! Out of the dryer and folded right into a drawer! MOMLIFE HACKED! Most resources you read on minimalism will tell you the same thing. Purge what doesn’t bring value to your life or home. Be the gatekeeper of what makes it back into your home. Don’t have more stuff than you have storage. Let this mindset seep into all aspects of your life and you will learn that less of the excess means more of what you love. However, most of us view our homes as a storage space (*cough like the basement*). We find every nook and cranny to store things. Some of us even have ‘stuff’ stored at other people’s homes or pay money to a storage facility to let our ‘stuff’ sit there. The problem with this is that it becomes a mental and physical burden on us. It hinders our ability to use this space for ‘living’. What if we viewed our homes as suitcases rather than a collection of storage spaces. What if our home was a place where we only keep what there is room for. We wouldn’t let it become full of random, distracting stuff. We would be selective and chose only the best things to keep. I have seen the benefits of reducing the excess and maintaining the amount that comes back into the space with things like my closet and kids toys. It has been really hard for me to extend that strictness to all areas of the home. This is my new challenge to myself. Each drawer, closet, and room is my suitcase, not my storage space. I think we all have these places in our home that we think need to be ‘organized’ better. For me it is places like the shoe closet, the office hutch in the kitchen, under the bathroom sink. Places in my home where I see an overflow are not problems that are simply solved by buying a cupboard organizer. The first step needs to be purging and then maintaining the excess so we only ever have what fits in the space. THEN we can buy that adorable cupboard organizer set, cause those are fun too. What areas in your home are suitcases and what areas are storage spaces? Thank you for coming by and reading. Don’t forget to subscribe to our weekly email.